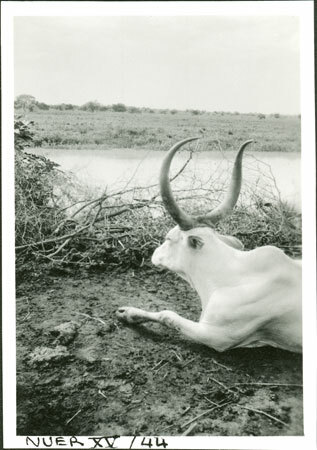 A portrait of an impressive white cow lying on the ground with large upward curving horns (known as wer), with the Akobo River visible adjacent to the kraal. It is likely that this photo was taken in May 1935 after Evans-Pritchard had completed a survey of the Anuak. Note on print reverse ms pencil - "22 230 Akobo [female symbol] wer boora" & print front border ms ink - "NUER XV/44"
Morton, Chris. "Nuer cow" Southern Sudan Project (in development). 03 Jan. 2006. Pitt Rivers Museum. <http://southernsudan.prm.ox.ac.uk/details/1998.355.722.2/>.